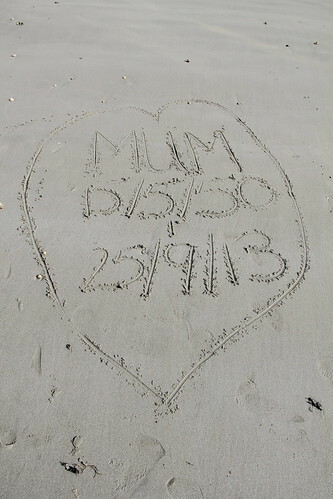 When we were at the beach on Friday I wrote a little note to my Mum in the sand. She loved Cobo beach and we spent so much time there together as a family. What I didn’t know was that my Auntie Josie walked from one side of the beach to the other and she had she found the heart in the sand. It seemed kind of appropriate, a little but like I was leaving a trail of Mum across the beach she loved. Dad and my sister have arrived back. It is lovely to see them but also so hard as it now is starting to feel real. I know we will be OK, I am just not sure what that OK looks like yet. 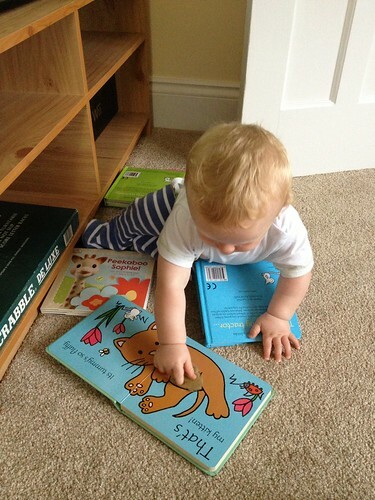 Over the last couple of weeks The Little Mister has just started getting properly interested in books. His Daddy loved reading and books are one of his favourite things in the world! It seems that The Little Mister is sharing his interest. He particularly loves the ‘That’s Not My…’ books and he turns the pages really rapidly and strokes the fluffy and rough bits. It is so sweet! He truly is the most amazing distraction to have at the moment! Today the weather couldn’t be more different from yesterday. This morning we had torrential rain and thunder and lightening. It kind of suited the heaviness of my heart and my dark mood. I had decided to invite family and friends over for coffee and cake, on the proviso that they brought cake. They certainly did the job, we have loads left over! They also brought flowers. I have some gorgeous bunches of flowers that I am so pleased with. They are making my house smell divine and that cheers me up. These were brought for me by my cousin. 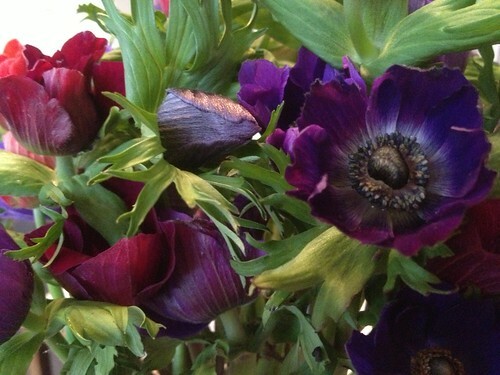 They are anemones and are beautiful, old-fashioned flowers. Thankyou so much to everyone who took the time to come and see us today. Your kindness and care mean so very much to us. Today has been a really strange day to be honest. It feels like a perfectly normal day and it has been such gorgeous weather that it is easy to convince myself that there is nothing wrong. Then I remember. I remember than my wonderful Mum is not coming back, I will never see her again and my sense of loss becomes overwhelming. So, just for today, as much as I could I pulled my eyes back to the day-to-day stuff. The Little Mister went to his swimming lesson and we all went to the beach with my brother-in-law and the kids. Our lives have to go on and I know that is something that Mum would have wanted. We finished off a lovely afternoon with fish and chips at my aunts house with some of my cousins and their kids. Our family might look a little different now but it has become even more important than ever. I am grateful for the things we still have even though it is still hard to try and think about the good things when I feel so devastated. Today, in many ways has been a good day. Today has been a really strange day. I slept badly and woke early thinking about my Mum and worrying about my Dad. 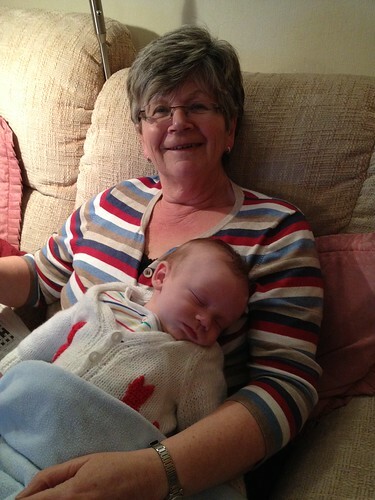 I miss my Mum so much already and still the thing that I find so upsetting is that she will not get to see The Little Mister grow up. She loved him so very much and she was so excited when he made his much longed for arrival. I love you Mum. I always will and I miss you so very much. 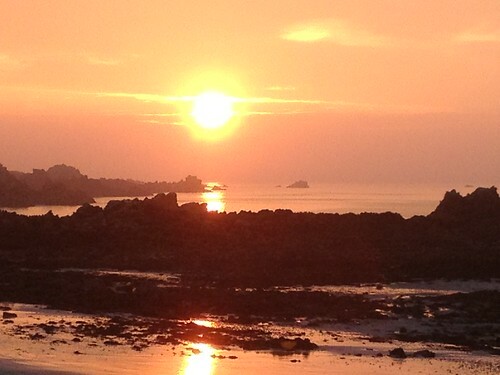 Today’s picture of the day is of the sunset which we watched down at the beach tonight. It was liked the heavens opened and the rays were escaping. Beautiful. My Mum and Dad have been on holiday in Greece and Dad phoned to tell me and my sister that Mum unexpectedly and suddenly died this afternoon. The whole afternoon has been taken up with coping, with phoning people and making arrangements for my sister to go out to Greece. Only now, am I sitting down and thinking and crying. I loved my Mum so much and she was very central to our family and our lives. I am going to miss her so much and I am absolutely devastated that she won’t be around to see The Little Mister growing up and he is so little that he won’t really remember her. I think that is the bit that is upsetting me that most. However, my Mum is now with Jesus. Safe in his arms with the Saviour she has served and loved all these years. I just wish we had had a bit longer with her. I wasn’t ready to say goodbye yet. 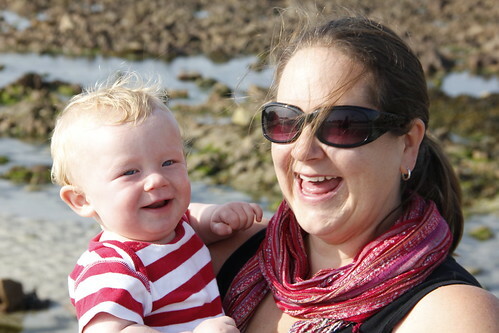 Is there anything better than seeing a scrumptious baby bum with chubby leg rolls and dimples? Bath-time has now become more of a challenge as The Little Mister will no longer sit or lie down. He is up, moving around, sitting, standing and even falling face first into the water. It’s wonderful stuff! My mother-in-law bought me two white wicker hearts which hang from the windows in our kitchen. When I got home from work I noticed that it made lovely shadows on the wall. 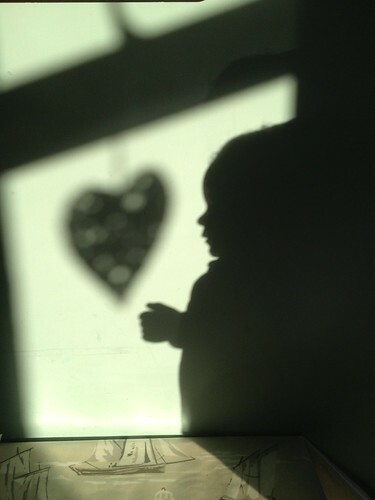 The Little Mister was sitting on The Mister’s lap and cast this shadow profile which I thought was so sweet. I am exhausted! 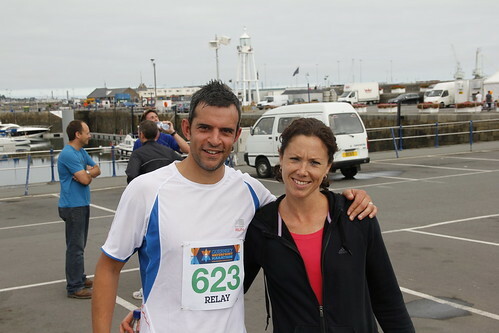 It was the Guernsey Waterfront Marathon today and it has just about finished me off!! Of course I wasn’t actually doing it myself but my sister and brother-in-law were doing half each so The Mister and I were looking after my niece and nephew for a while. It was great fun and a lovely atmosphere with lots of people cheering the runners on. Louise and Philip did a really good time and completed it in 3 hours 20 minutes which was brilliant. So, today’s picture obviously had to be a picture of team Mr and Mrs Smith. 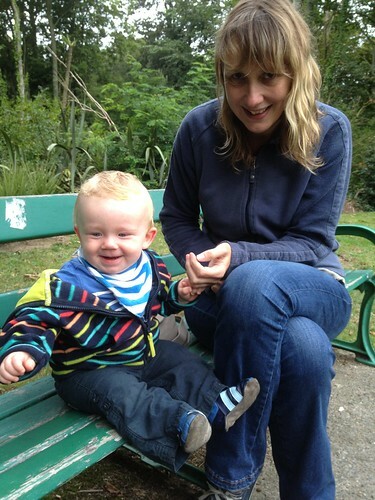 My friend Maggie was over on the island for the weekend so The Little Mister and I met up with her and went for a walk. Maggie and I used to work together but she has moved back to the UK so our chances to catch up are few and far between. All I have to say is thank goodness for Facebook! Being able to keep up with friends in the UK and further afield makes such a difference. Yes of course we miss people but it’s like we see them all the time. So, to all our friends and family who don’t live on the island. We miss you and love you and we look forward to seeing you all again soon!